Little VIP Bandz GIVEAWAY!!! 10 Winners! We recently had the pleasure of trying out and reviewing Little VIP Bandz, and now we’d love to share some with YOU! Christine, of Little VIP Bandz, is generously providing 10 sets (5 girls, 5 boys) to giveaway. Little VIP Bandz are wristbands meant for children to wear that contain their parents cell phone number. In case a child gets lost in a crowded area – theme park, fair/carnival, sporting event, etc. 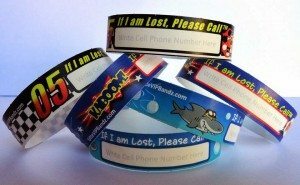 – a responsible adult can call the number found on the wristband and hopefully reunite that ‘lost’ child with their parents sooner-than-later. Having my kids wear these bands at Walt Disney World sure gave us peace of mind! Enter for a chance to WIN one of ten sets of Little VIP Bandz using the Rafflecopter form below. This contest begins Tuesday, October 15 at 12:01 a.m. (eastern) and ends Thursday, Oct. 17th, 2013 at 11:59 p.m. Just 3 days to enter!! This giveaway is eligible to residents of… earth! (Yep – worldwide, enjoy). And be sure to visit Little VIP Bandz on Facebook or view all designs available in their Etsy shop.